I know this looks deceptively like the healthy low-cal strawberry smoothie I posted a few days back. But it so isn’t. This strawberry mouse is rich, sinful and delicious. 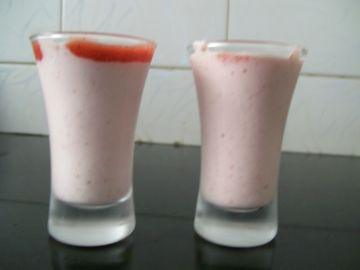 To make the mousse, puree a cup of strawberries with 1 tbsp caster sugar. Because you are using sugar this time around, this should give you a thicker puree. Taste the puree and add some more sugar if it isn't sweet. It really depends on how tart the strawberries are. Now pour half a cup of cream in a bowl and whip until thick. I like to have a bowl of ice under my cream to keep it cold while it's being whipped. Fold in the strawberry puree as delicately as you can. Stay clear of the large martini glass this time around, and pour the mousse in shot glasses instead. Chill a couple of hours before digging in!